Fulton County, Ohio wild bird sightings, through2005. 20053/20/5 Wauseon Reservoir First COMMON LOON I've seen this season, plus 8 Common Mergansers, 14 Scaup/RingNecked Ducks, 6 RingBilled Gulls-- fewer birds than I expected! Archbold Reservoir A dozen Mallards, a dozen Ringbilled Gulls, a Bufflehead drake, a Lesser Scaup drake. U/SR34 Hundred or so RingBilled and Herring Gulls in the field. 3/29/5 Denny S. told me about the Ridgeville Corners Sewage Lagoons so I had to check: zilch. Archbold Reservoir Different story here: 39 RED-BREASTED MERGANSERS (my first of season), 50 Lesser Scaup, 10 RingBilled Gulls, 2 pair of Redheads, 2 pair of RingNecked Ducks, 1 Canada Goose on the south pond. The north pond had only 10 Scaup and another Canada Goose, loudly calling for the other. Following 66 north out of Archbold to the intersection of county roads J/23 where a tiny pond on the right held TWENTY Wood Ducks, 6 Blue Winged Teal, 4 Mallard, 1 GreenWinged Teal drake. Not far down the road in a mere flooded field was a huge congregation of ducks: 5 GreenWinged Teal, 12 PINTAIL DUCKS, 6 American Wigeon, 4 RingNecked Ducks, 12 Canada Geese, and 100 Mallards (exactly!). By contrast, the usually productive huge "perfect" marsh at SR66/Turnpike was empty. L/22 had lots of swamp mowed and much more dry than normal-- and much fewer birds than normal too: 2 Wood Ducks, 20 or so Mallards, 4 BlueWinged Teal. StateRoute2/CountyRoad 20 heavy traffic didn't permit more than a quick stop: Wigeon, Shoveler, Hooded Merganser, Mallard, Bufflehead... Wauseon Reservoir So huge and also amazingly deserted: 100+ Scaup/RingNecked flock, 10 Redhead pairs, and a pair of Bufflehead. Rusty Blackbirds were mixed in with Grackles, Cowbirds, Starlings and RedWinged Blackbirds in almost all blackbird flocks. 3/30/5 Jon Diller on OhioBirds@Envirolink: "Observed one Common Loon at the Archbold Reservoir and one at the Wauseon Reservoir today. Both birds were in their summer plumage. There were 3 to 7 Horned Grebes on both reservoirs also-mixed plumages." 73-degree day begged for a walk after work at Goll Woods, where I walked only the deciduous loop. Birds were few and far between but WOW! : excellent viewing of a male YELLOW-BELLIED SAPSUCKER. Hearing a triplet-woodpecker call approaching I watched as a male PILEATED WOODPECKER flew into view, landing just eight feet off the ground! Beautiful bird that I watched for a long time, admiring its white wing patches as it went to the ground and then back up the tree several times. Had to write him off when a family with several loud children approached on the trail, but WOW! 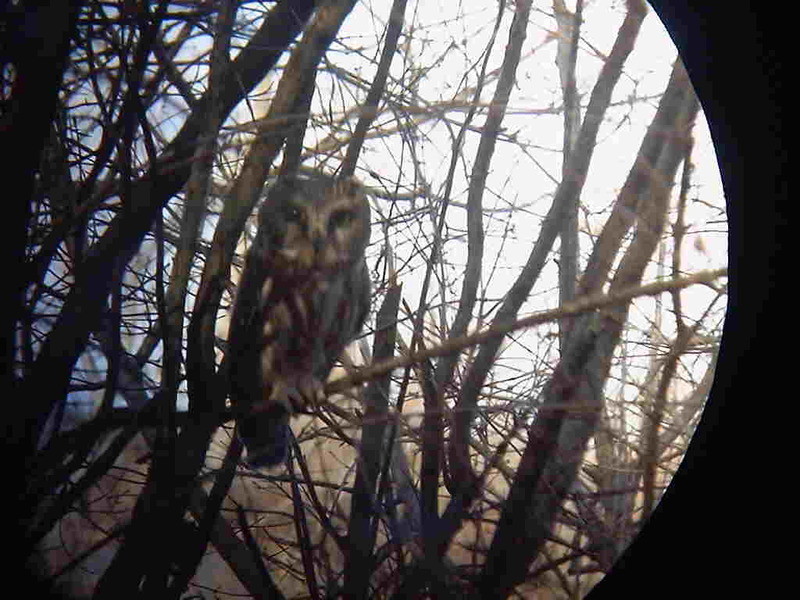 Also, my first two PHOEBES of the season called each other and flitted close, oblivious to my presence. Harbinger-of-Spring was the only wildflower in bloom, and Anglewings were flying about the woods, with lots of harder-to-identify flies, wasps and millers. Fox Squirrels barked at Wild Turkeys. Western Chorus Frogs ran their thumbs over combs all over the woods. Other more common birds: BARRED OWL chased by a Crow, GoldenCrowned Kinglets, a Turkey Vulture, 2 RedWinged Blackbird, a Grackle, 2 Titmice, Chickadees, Downy/RedHeaded/RedBellied Woodpeckers, Flickers, WhiteBreasted Nuthatches. Enroute home, I saw my first flock of 50 PECTORAL SANDPIPERS in the flooded field at H/22.75. 4/9/5 CoRd J /23 Tiny Pond held 30 BlueWinged Teal, a Great Blue Heron and 6 pair of Wood Ducks. The flooded field next to it had 10 Bonaparte's Gulls, 16 RingBilled Gulls, 2 Shovelers, 8 BlueWinged Teal, 14 Mallards, 3 Canada Geese, Pectoral Sandpipers somewhat hidden in the grass. Also my first-of-season Lesser Yellowlegs. 6/1/5 An Ovenbird sang loudly near the road near Goll Woods. Archbold Reservoir Absolutely nothing here, until I sighed, and a Great Blue Heron, a RingBilled Gull and 20 Canada Geese suddenly flew in! Still not much, but hey, lotsa stuff in bloom now: Hairy Beardtongue, Virgina and LargeLeafed Waterleaf, Yarrow, Wild Parsnip, Black Locust (yum! ), Oxeye Daisy, Yellow Wood-Sorrel, Moneywort, Alsike, Hop, White, Red, and Yellow Sweet Clover, Yellow Goatsbeard, Butterwood, Star of Bethlehem, Blackberry, Mousear, Star and Common Chickweed, and English Plantain (hey when is a wildflower just a plain old weed?!! ), plus first (for me)-of-season butterflies like Silver Spotted Skippers, Monarchs, RedSpotted Purples, American Painted Ladies, and European Skippers. 7/14/05 Archbold Reservoir Just a PiedBilled Grebe (juvenal) Wauseon Reservoir 3 Canada Geese and Tree Swallows 66/Turnpike In shocking contrast to WmsCo 16/c, this place is bone dry. A flock of about 50 Killdeer had a look of shock, "There USED to be water here, I swear!" 8/15/05 Archbold and Wauseon Reservoirs Empty SR66/Turnpike was totally overgrown with tall weeds! Dry, way too dry for any shorebird. And no shorebird habitat at all (for opposite reasons-- way too much water) at Williams County's16/C. 8/19/05 Fri The local shorebird sites just aren't coming through this year (Williams County's 16/C is inexplicably too wet, while Fulton County's SR66/Turnpike is far too dry), 8/31/05 Archbold Reservoir, Wauseon Reservoir, 66/Turnpike All totally empty Goll Woods Nothing extraordinary, just Jewelweed and Tall Bellflower. 9/13/05 Archbold/Wauseon Reservoirs empty 10/7/05 Archbold Reservoir/Wauseon Reservoir Empty. Strangely no gulls anywhere locally! 12/11/5 From Toledo Rarebird.org "My dad reported seeing a large flock of Sandhill Cranes north of Delta this afternoon. Not sure of the exact time but I would put it between noon and 2pm. He said they were relatively low leading me to suspect they may have been landing. Unfortunately I'm still in school down here in WV. He also reported seeing a Northern Harrier and a mixed flock of Buntings and Larks north of Delta as well. --Joe Hildreth 20 Delta, OH/ Morgantown, WV" 12/17/05 Joe Hildreth and I covered a section of Goll Woods for the Goll Woods Christmas Bird Count today, the best bird of which had to be the HERMIT THRUSH found by eagle-eye Joe, allowing for great viewing right by the trail! This was of course during the only half-hour I was without my cameras. Also during this half-hour FOUR SANDHILL CRANES flew overhead just above the treetops, the last dragging a leg. At the corner just outside of Goll Woods was a wonderfully cooperative ROUGH-LEGGED HAWK (light male) that perched overhead, then flew low beside the car showing us every identification point possible! After lunch we joined up with Jon Diller to cover the Boy Scout Camp near Lake Harrison State Park. Some numbers for our group's section were only one Canada Goose (the reservoir was frozen), 6 Mallards (only because of the warm pond at the water treatment plant), 4 Northern Harriers, 3 Cooper's Hawks , 10 RedTailed Hawk, 3 Kestrels, 3 Pheasants, 4 Sandhill Cranes, 84 Mourning Doves, 96 Rock Doves, 5 RedBellied Woodpeckers, 4 Downy Woodpeckers, 3 Flickers, 20 Blue Jays, 13 Crows, 17 Larks, 7 BlackCapped Chickadees, 6 Tufted Titmice, 11 WhiteBreasted Nuthatches, 4 Brown Creepers, 1 Carolina Wren, 7 Eastern Bluebirds, 1 Hermit Thrush, 150 Starlings, 2 Cedar Waxwings, 9 Song Sparrows, 1 WhiteThroated Sparrow, 15 Juncos, 2 Lapland Longspurs, 217 Snow Buntings, 16 Cardinals, 37 House Finches, 6 Goldfinches, 240 House Sparrows. Team Doug & Micki Dunakin discovered FOUR lingering TURKEY VULTURES at Harrison Lake. For a full list see the Black Swamp CBC webpage. 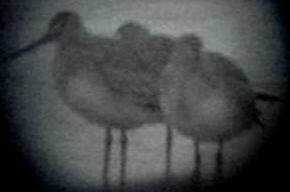 12/18/05 " Hi John, These are the two pics I took of the Sandhill Cranes in Fulton County yesterday, North of St. Rt. 20 on County Rd. 12 about 3/4 of a mile...--Marc P." 20041/3 From OhioBirds@Envirolink: "Karin Tanquist and I (Pat Coy) drove from Milwaukee, WI to Peninsula, OH today, and stopped for some birding and hiking at Goll Woods State Nature Preserve in northwestern Ohio, in Fulton County. Goll Woods is 300 acres of the last essentially undisturbed remnant of the primeval forest that once graced the Black Swamp territory of NW Ohio. The trees in Goll Woods are among the largest in Ohio, some reaching 400-500 years old with diameters of six feet. It is a magical place, as the numbers of RedHeaded Woodpeckers seemed to suggest: RedHeaded Woodpecker 13, Downy Woodpecker 7, RedBellied Woodpecker 5, Hairy Woodpecker 1, WhiteBreasted Nuthatch 14, RedBreasted Nuthatch 1, BlackCapped Chickadee14, Carolina Wren 6, GoldenCrowned Kinglet 1, Junco 5, Cardinal 21, Goldfinch 4, RedTailed Hawk 1.Goll Woods is just 2 miles south of the Turnpike, right off the exit for Rte 66 and Archbold, OH. It makes a great stop on a long drive across the Midwest...BTW, on the drive from Wisconsin to NE Ohio today, we also had 29 RedTailed Hawks from Chicago to Peninsula.--Patrick Coy Peninsula, OH" 1/7/4 Off work at 4pm, took Wms/FultonCo LnRd (American Tree Sparrow, Starlings, Horned Larks, Juncos, Cardinals, RedTailed Hawk) to Archbold Water Treatment Plant (only 20+ Mallards), then through back streets watching feeders (Mourning Dove, House Sparrows, House FInches, Goldfinches) to Archbold Reservoir (only Canada Geese, Rock Pigeons), then to Sauder's, continuing on SR66 to Ohio Turnpike (Harrier) then to Goll's Woods by 5:20. 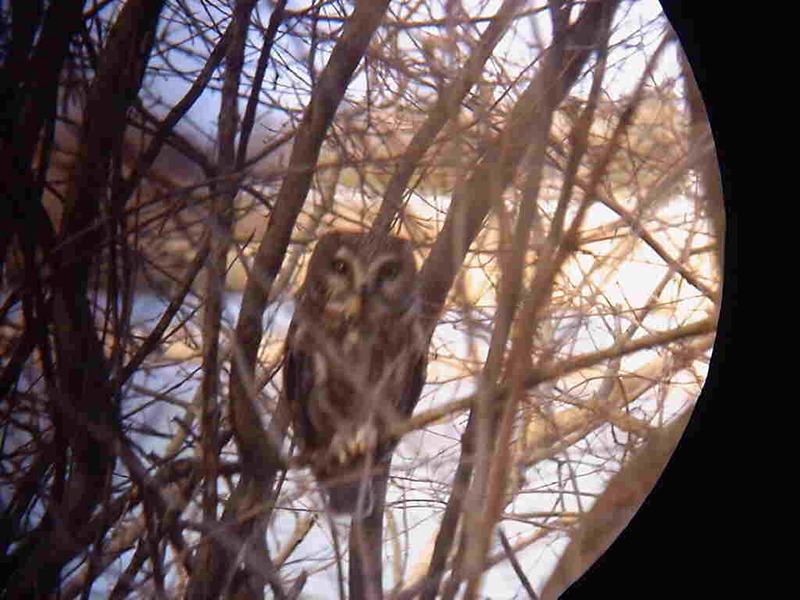 Best bird by far was BARRED OWL, but heard a GREAT HORNED OWL there too. Too late for Woodpeckers, or anything but Cardinals, but many deer walking around in the moonlight. 1/15 Archbold Reservoir A dozen Mallards kept the last open water from freezing with constant paddling. 1/18 Wauseon Reservoir Completely frozen. 1/19 Archbold Reservoir 2 Canada Geese Goll Woods Dave M. & I covered the trails; only ONE RedHeaded Woodpecker, and only ONE GoldenCrowned Kinglet. )VER ONE THOUSAND SNOW BUNTINGS with about 100 Larks at SR2/CR25. I could only pull 7 LAPLAND LONGSPURS out of the crowd. Snow Buntings landed on the road extremely close to the road for a very enjoyable experience! 1/23/4 Archbold Reservoir empty Wastewater Plant a dozen Mallards.2/5/4 Archbold Reservoir 8 Mallards keep a tiny sliver of water from freezing over.3/5/4 Archbold Reservoir a pair of Goldeneye (I don't think I've ever seen them in Fulton County! ), and 5 RingBilled Gulls. 66/Turnpike 75 Mallards, 17 Canada Geese. I was expecting much more. Archbold Water Treatment Plant 4 Canada Geese. State Route 34 at the Henry/Williams County Line 27 Mallards, 5 Lesser Scaup and a Wood Duck. 3/6/4 Enroute to Michigan, we stopped off at the Archbold Reservoir 28 Lesser Scaup, 5 Goldeneye, 2 RingNecked Ducks, 1 Mallard, 1 Canada Goose, 1 Great Blue Heron. Wauseon Reservoir Appeared empty but the scope revealed about a hundred birds bouncing on the chop stirred up by the strong wind, making visibility tough: Scaup, RIngNecks mostly but also a few Bufflehead, RED-BREASTED MERGANSERS (my first of the season), and two Canada Geese. No Gulls. 3/17/4 Archbold Reservoir This vast expanse was wasted on just two Canada Geese and a RingBilled Gull. Turnpike/66 Thirty Wood Ducks at least, on one fallen branch in the little swamp. 3 Hooded Mergansers (one hen), 2 pair of Shovelers, a pair of BlueWinged Teal, 8 Mallards and 7 Canada Geese on the big swamp: not much for such a huge area. Wauseon Reservoir 212 Scaup (didn't scope every bird, but every one I did was Lesser), 23 RingBilled Gulls, 4 Redheads, 4 Hooded Mergansers, and 1 RedBreasted Merganser drake. 3/28/4 SR66/Turnpike Shovelers, BlueWinged Teal, Mallards, Scaup (under ten of each) and 4 Canada Geese. Best bird here: my first-of-the-season Great Egret. Wauseon Reservoir 30 RedBreasted Mergansers, 12 RingBilled Gulls, 8 Ruddy Ducks, 4 Canada Geese, 3 Horned Grebes, 2 Mallards, a Hooded Merganser, and 5 of my first-of-the-season Bonaparte's Gulls in winter plumage. 4/1/4 Archbold Reservoir 5 Ruddy Ducks and 34 RingBilled Gulls. Was surprised by a big flock of PIPITS (first-of-season for me) at the intersection of W and 25, at the Fulton/Williams/HenryCo corner. 4/4/4 Wauseon Reservoir 2 Common Loons, 2 RingBilled Gulls and 9 Ruddy Ducks. SR66/Turnpike A dozen RingNecked Ducks, a dozen Mallards, one Great Egret. Archbold Reservoir A pair of Bufflehead, and single drake RingNecked Duck and a Lesser Scaup drake.4/1/4 Archbold Reservoir 5 Ruddy Ducks and 34 RingBilled Gulls. Was surprised by a big flock of PIPITS (first-of-season for me) at the intersection of W and 25, at the Fulton/Williams/HenryCo corner. 4/4/4 Wauseon Reservoir 2 Common Loons, 2 RingBilled Gulls and 9 Ruddy Ducks. SR66/Turnpike A dozen RingNecked Ducks, a dozen Mallards, one Great Egret. Archbold Reservoir A pair of Bufflehead, and single drake RingNecked Duck and a Lesser Scaup drake. 4/10/4 Delta Reservoir Joe H was home and saw 2 Wood Ducks, 6 BlueWing Teal, 3 Mallards 2 Kingfishers 4/11/4 Delta Reservoir Joe H was home and saw 6 Bufflehead. He also reported Blue and Green Winged Teal at Turnpike/66, and added a Solitary Sandpiper at H/18. 7/13/4Archbold Reservoir (just Canada Geese) SR66/Turnpike Marsh (just Great Blue Herons)7/15/4 SR34/CR26 Judy L. reports ROSE-BREASTED GROSBEAKS are STILL coming to her feeders! 9/6/4 SR66/Turnpike Weedy and flooded, not suitable habitat for shorebirds: a Kingfisher, a Great Egret, 2 Turkey Vultures, 6 DoubleCrested Cormorants, 5 Killdeer, 12 Mallards, 24 Chimney Swifts Wauseon Reservoir Just a Cormorant.10/4/4Wauseon Reservoir Empty but for six Killdeer, odd birds for this place.10/6/4 Archbold Reservoir 3 DoubleCrested Cormorants. Wauseon Reservoir A RIngBilled Gull 66/Turnpike 3 Great Egrets, 5 Mallards, a peep, lotsa Killdeer, Great Blue Heron.10/7/4Archbold Reservoir A trackmeet... 66/Turnpike A LESSER YELLOWLEGS still hanging around.10/8/4 Archbold Reservoir zero 66/Turnpike 75 Mallards and 3 Great Blue Herons.10/23/4 SR66/Turnpike Enroute to Detroit stopped off to find a pair of Greater Yellowlegs and a pair of Lesser Yellowlegs.11/8/4 Archbold Reservoir Expected much after yesterday at Hurshtown Reservoir-- nothing here however. 66/Turnpike 2 drake Hooded Mergansers in perfect light, simply beautiful.11/9/4 Archbold Reservoir Four Ruddy Ducks and 12 Canada Geese. 66/Turnpike 3 Great Blue Herons, period. sigh. He saw three of these at Fulton Pond and two at Delta Reservoir. Can't wait for tomorrow! 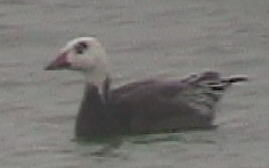 2/11/02 Archbold Reservoir enroute to see the unusual geese today, held only a pair of Common Goldeneye and 4 RingBilled Gulls. Wauseon Reservoir had about 50 gulls, evenly split between Herring and RingBilled. Fulton Pond's geese were still there today, fortunately. Amidst the perhaps 20 Canada Geese were 4 unusual geese: Goose #1 looked like that illustrated in Sibley's as a Canada/WhiteFronted cross, except that it had a large thick white breast band as well as the white end. 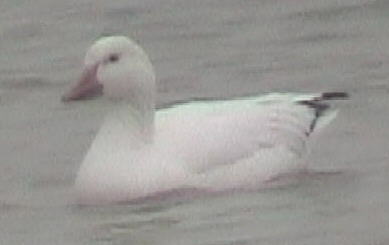 The white cheek patch of the Canada was evident, as well as an eye-ring of white. It was as large as the largest Giant Canada there. Feet and bill were orange. Goose #2 looked almost exactly the same, except that the white cheek patch was irregular and swallowed the eye. There was a black eye-ring on this guy. Goose #3 was smaller, about the size of our short-necked migrant Canadas that are only here in the winter. His neck was chocolate brown where a Canada should be black, and his cheek patch was tan instead of white. His bill was also a tan-grey instead of black. There was no opportunity to see his feet. Up to this point, it appeared we had Canada/WhiteFronted Crosses, but Goose #4, whom we found last on a walk around the pond, was extremely large (larger than any of the Canadas) and very obviously domestic. Not knowing my domestic geese real well, I would say it was a Greylag, although it looked nothing like the Greylag illustrated in Peterson's (oddly enough, the chocolate brown goose did look like Peterson's greylag somewhat, in that when he swam away one could see obvious striping on the back of his neck). It was definitely not Chinese, or African, or Barred, or Egyptian, etc but had lots of white with black striping on the grey throat. Bill was bright orange, as well as its feet. This last discovery made me think that perhaps here was one of the parents of the other three. Discoverer Joe Hildreth also had photos of two similarly unusual geese he found on nearby Delta Reservoir. We also saw several large flocks of blackbirds, one of which appeared to be totally made up of Grackles! Peterjohn's Birds of Ohio had amazing facts about this bird: Did you know that MARKET HUNTING (who would eat a sandpiper?!!) almost exterminated this bird, such that there were only FIVE Ohio sight records between 1900 and 1930?! Or that adult Hudsonians migrate non-stop from Canada to South America?! This explains why these six are juveniles! And Peterjohn was already on to the fact that they appear most commonly between Sept 20 and Oct 15. Eerily Nostradomus-like, he also knew that they almost always appear as individuals or groups of 6 or fewer (although 143 showed up at Ottawa Refuge 9/28/1975). Somehow I have the odd feeling he knew I would see these and where... 10/8/2001 Wauseon Reservoir had only 2 Bonaparte Gulls. The flat at the Archbold turnpike exit had only Great Blue Herons and both Yellowlegs. 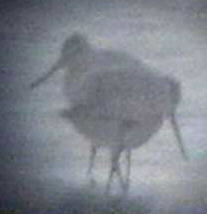 10/9/2001 Only Yellowlegs and Great Blue Herons and Killdeer at Archbold Turnpike Exit. Goll Woods had a plethora of RedHeaded Woodpeckers, White Throated Sparrows and RubyCrowned Kinglets. I also saw my first WINTER WRENS of the season, playing at my feet! 10/17/2001 Only a single Great Blue Heron at Archbold Turnpike Exit, only a single DoubleCrested Cormorant at Archbold Reservoir, only a single Horned Grebe (my first of the season) at Wauseon Reservoir. 10/23/2001 Took the Tuliptree Trail at Goll Woods tonight after work. Lots of WhiteThroated/WhiteCrowned Sparrows, Ruby/GoldenCrowned Kinglets, YellowRumped Warblers, Titmice, Chickadees, White/RedBreasted Nuthatches, Hermit Thrushes (4 at once in one spot! ), and Woodpeckers (Downy, Hairy, Flickers, RedHeaded and mostly RedBellied). My first FOX SPARROW of the season was there (of course, I haven't been getting out much), as well as a Least Flycatcher, both very cooperative and unafraid. BUT BEST OF ALL WERE THE TWO (not one but two!) PILEATED WOODPECKERS! 10/24/01 2 dozen Dunlin at the Archbold Turnpike Exit. 10/29/01 I walked the Toadshade Trail at Goll Woods. It was dark by the time I got home, because of the time change. Much like last time I was here: Phoebe, Hermit Thrushes (4 in one spot), both Kinglets, White Crowned/Throated Sparrows, 2 Fox Sparrows, 1 Pileated, a Barred Owl, Yellow Rumped Warblers, etc boring by comparison. Oh, and I did rescue a tiny beleaguered Sharpie from a mob of crows by my mere presence. And a large Cooper's Hawk flew quickly away with agile grace through the thick pine woods. 11/5/2001 Archbold and Wauseon Reservoirs had no birds at all. 11/14/2001 Archbold Reservoir had no waterfowl, but there were about 50 SNOW BUNTINGS that careened in a flurry over my windshield, up over the dike, then back. They were astoundingly white against the dark steel grey sky, and again when they landed on the dark green grass of the dike, as close to the car window as one would only expect Starlings and English Sparrows! 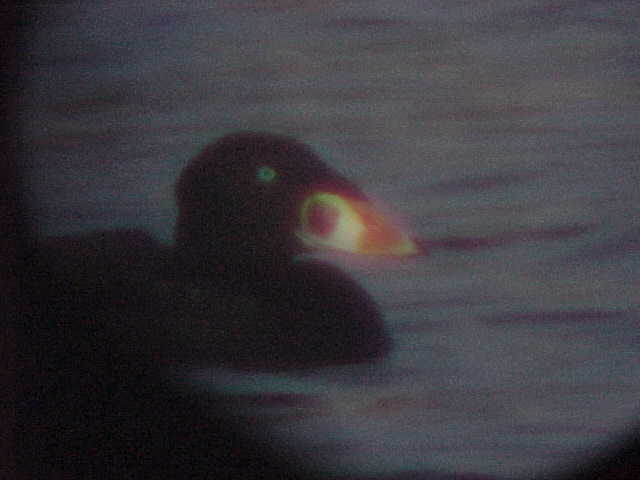 11/27/2001 Rushed around after work to Archbold Reservoir only to see 6 Mallards. Archbold's Turnpike Exit also only had 3 pair of Mallards. That was better than Wauseon Reservoir, though, which had nothing at all. The overpass pond at US 24/SR 108 at least had about 30 Canada Geese. 12/6/2001 Archbold Turnpike Exit had hundreds of Canada Geese, but I couldn't pick out any unusual geese in the short time I could feel comfortable scoping with traffic uncomfortably close. Wauseon Reservoir was absent of all but loud large construction machinery. 12/9/2001Joe H. reports that Delta Reservoir "only held 20 canadas, Pond at Worthington Steel held 50 canadas and about 20 killdeer, Wauseon Res. had gulls but without a scope couldnt tell much.12/15/2001 Dan, Dean, Pete, John, Micki, Doug, Lach and I joined to do the Goll Woods Christmas Count today. The remarkable birds on this remarkably warm day (in the 40's!) included RedShouldered Hawk, 4 Great Horned Owls, 2 Pileated Woodpeckers, 2 Eastern Meadowlarks (up in a tree, singing loudly!). Unusual factoids: no gulls, no buntings or longspurs, no waterfowl except for Mallard and Canada Goose. More numbers later. 12/19/2001 Joe Hildreth reports from: "Delta Reservoir 35 Canada GeeseWorthington Steel 20 Canada Geese Wauseon Reservoir 15 Mallards, 2 Black Ducks, 1 Great Blue Heron, 125 RingBilled Gulls" 12/20/2001Joe Hildreth reports from: "Delta Reservoir a Kingfisher, 25 Canada Geese, 2 Mallards and 5 RingBilled Gulls. Worthington Steel 190 Canada Geese and 2 Mallards Wauseon Reservoir 45 RingBilled Gulls, 1 Bonaparte Gull, 3 Bufflehead, 1 female Goldeneye, and a flock of 10 Snow Buntings mixed with 2 Horned Larks. Independence Dam 25 Wild Turkeys. Archbold Reservoir empty. Lots of mixed SnowBuntings/Larks throughout the countryside." 12/21/2001Joe Hildreth reports "70 Canada Geese and 1 Black Duck Worthington Steel 190 Canada Geese and 2 Killdeer Fulton Pond Kingfisher and Pine Siskin Swanton Reservoir PiedBIlled Grebe, 2 Mallards, and 5 RingBilled Gulls." 12/28/2001 Joe H. reports from Swanton Reservoir 100 Mallards, from Delta Reservoir 50 Canada Geese and 20 Mallards, and 15 Pine Siskins from the Window on Wildlife at Oak Opening's Mallard Lake. 2000 1/25/00 Archbold OH has it's very own downtown Cooper's Hawk, this one in a large spruce at the corner of S. Defiance St and South St. watching all the traffic go by. 2/6/00 CR 24/E outside Archbold OH now has a steadily building population of snow buntings--now numbering several hundred! 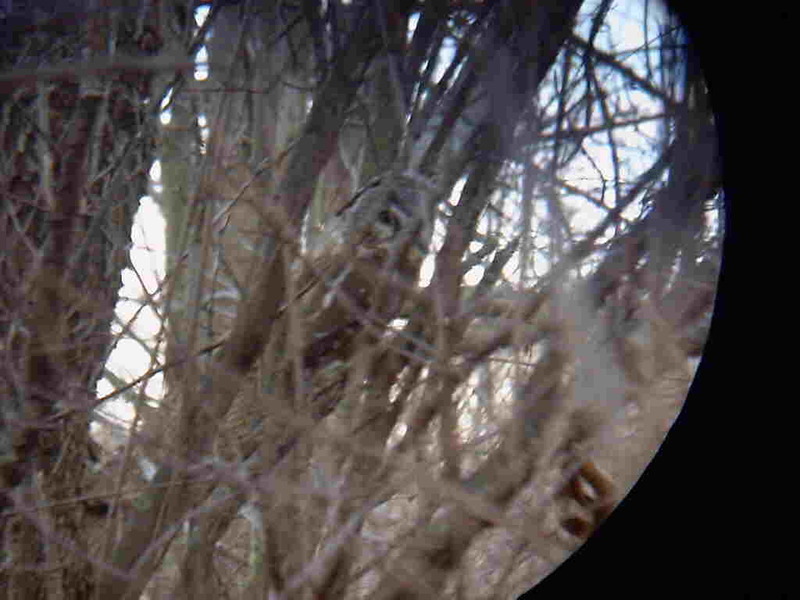 oh, and a Cooper's Hawk. 2/17/2000 An immature Cooper's Hawk flushed from the bushes at Sauder Village in Archbold, probably after the pretty white [Rock] doves, flying overhead. The Snow Buntings and Lapland Longspurs are evidently all gone-- only Horned Larks could be located. 4/25/2000 Broke out of the mold and went to Goll Woods, walking the 1 3/4 mile Toadshade Trail. Nothing to report, however. : ) 5/3/2000Goll Woods' Oak Trail was a very eerie Silent Spring walk, with only Gnatcatchers far above in the canopy. 11/15/2000 Goll Wood's Cottonwood Trail was remarkable. Today was Woodpecker Wednesday, with many WhiteBreasted Nuthatches, Downy Woodpeckers, RedBellied Woodpeckers, but MOST of all, many RedHeaded Woodpeckers everywhere I looked all along the trail. I was surprised to see a male and a female Flicker still here. MOST AMAZING WAS A PILEATED WOODPECKER at the "1/4 mile to Parking Lot" sign. Amazing sight on the three-pronged huge bare yellow dead tree. Then it flew directly overhead. This is only the second Pileated I have seen, and the first Pileated I have seen in Ohio (the first one was in Florida)! The only non-Woodpeckers there were Cardinals, Crows and a Cedar Waxwing. 12/16/2000 Short Goll Woods walk in the middle of a cloud so thick I could barely see ahead of me. Lots of RedHeaded and Downy Woodpeckers, Nuthatches, Chickadees, Titmice and a RedTailed Hawk. No sign of the Pileated. Christmas Count was cancelled due to the bad roads and extreme fog.